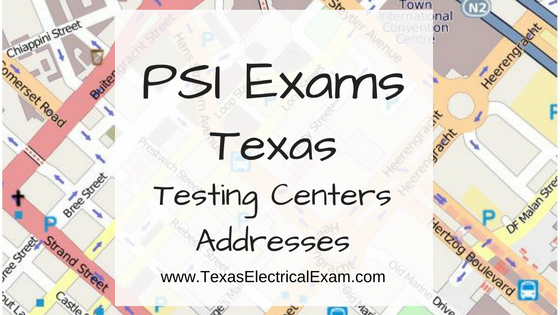 Abilene, Texas 1290 S Willis STE 109, The test site is on the corner of South 14th Street and Willis. The site is behind the First Financial Bank. From I-27 S, take exit 120B toward 45th Ave, and merge onto Canyon Dr. Turn right onto SW 45th Ave. Turn right onto Teckla. From I-27 N, take exit 119 toward Hillside Rd/ Western St. Merge onto Canyon Dr. Turn slight left onto S. Western St. Turn left onto Paramount Blvd. From I-40, turn onto S Western St. Turn right onto Paramount Blvd. Austin, Texas 6448 Hwy 290 East, Suite F111 If Southbound on IH 35, exit at 238A and take the right off-ramp following West 2222 (238-A ). Stay on the I-35 service road to the second light. Take a left at the traffic light at Hwy. 290 E. and stay on the Hwy. 290 E. service road. Take a left at the traffic light onto Cameron Road, go through the light and the testing center is in the business park on the left, Ste. F-111. PSI is located in NORTH Austin at the North West corner of Cameron Road and the West bound access road to Hwy 290 E. La Costa Business Park, Ste F-111. Corpus Christi, Texas 2820 South Padre Island Dr., Suite 105 From So. Padre Island Drive East, exit at Kostoryz. Loop back under the Kostoryz light, travel west on the access road to the 2820 building. The examination site is located between Kostoryz and Ayers at the 2820 Building on the North site of the SPID access road. Dallas, Texas 1140 Empire Central Dr., Suite 610 From I-35E Southbound (Stemmons Fwy), exit Empire Central (#434A), turn right on Empire Central Dr. ONE EMPIRE BLDG is on the left. From I-35E Northbound, exit Empire Central and turn Left on Empire Central. ONE EMPIRE is on the Left. From Hwy 183 Eastbound (John carpenter Fwy), exit left on Regal row, turn right on Governors row, and turn left on Empire central. ONE EMPIRE is on the right. From Hwy 183 Westbound, exit Mockingbird LN turn right on Empire Central. ONE EMPIRE is on the right. Richardson, Texas 300 N. Coit Road, Suite 172 From 75 South, take the Belt Line Road exit and turn right on Belt Line Road. Stay on Belt Line Road until you reach Coit. Turn right onto N Coit. The building is on the right hand side. If you are coming in from LBJ (I635) and going north on 75, you will turn left onto Belt Line and turn right onto Coit. From I-10 W, take the Airways exit North. Turn right at the first light (Viscount). Turn right on Westmoreland Dr.
Fort Worth, Texas 6801 McCart Ave., Suite B-1 From I-20 take the McCart Ave exit #435. Go South on McCart Ave passing Altamesa Blvd. You will turn left at the next light which would be Southpark Lane. To the right you may enter the 1st immediate parking entrance or the 2nd parking entrance on your right at 6801 McCart Ave Professional Building. Our office suite is B1 which is located on the Northside of the building facing Southpark Lane. Harlingen, Texas Executive Central, 722 Morgan Blvd., Suite C From Expressway 83, exit on Ed Carey Drive. Go North on Ed Carey Drive. At intersection of Ed Carey Drive and 77 Sunshine Strip, turn left onto 77 Sunshine Strip. Stay on 77 until it joins Morgan Blvd (Morgan Blvd is also road #507). Where 77 joins Morgan Blvd is like a ?Y?, stay to the right. Stay in the right lane and turn into the parking lot of 722 Morgan Blvd. Parking sign is in Blue: Reserved for Tenants and Customers of Executive Central Office Building. Houston, Texas 9800 Northwest Freeway, Suite 200 From Hwy 290 EASTBOUND take Exit 13C toward West T C Jester Blvd. Stay Straight to go onto N Loop Fwy W. Make a u-turn onto N Loop Fwy W. Stay on the feeder road, Sheraton Hotel is on the right as the road curves right. Turn into the parking lot immediately after the Sheraton Hotel and before the office building. Center is on the 2nd floor. Driving north on Loop 610 West exit at T.C.Jester and then u-turn under Loop 610. Stay on the feeder road, Sheraton Hotel is on the right as the road curves right. Turn into the parking lot immediately after the Sheraton Hotel and before the office building. Center is on the 2nd floor. Houston, Texas 11811 I-10 East Fwy, Suite 260 From I-10 EASTBOUND, take the Federal Rd exit #778A. U-turn under the freeway and come back on the feeder road going West. Building is on the right hand side, next to Papacitas. From I-10 East, take the Holland Rd exit. Stay on the feeder road, building is on the right hand side, next to Papacitas. Houston, Texas 650 North Sam Houston Pkwy, East, Suite 535 From the Beltway 8 going West, exit Imperial Valley Drive. U-turn under the belt. Go East on the Service Road (N Sam Houston Pkwy E). The site is just before the Hardy Toll Road Exit. From I-610, take 45-North toward Dallas, exit Beltway 8 East. Go East on the Service Road of Beltway 8 (N Sam Houston Pkwy E). Houston, Texas 9555 W. Sam Houston Pkwy South, Suite 140 The street address is on the marquee in front of building (9555 West Sam Houston Parkway South). On a smaller sign, sitting down in the grass next to the entry on Bissonnet, is the notation, "One West Belt". The Sam Houston Pkwy is also known as Beltway 8. From US 59, heading North: Take the Bissonnet exit and turn left (under the freeway) onto Bissonnet. Go about one mile - the building is on the right just before you reach the West Sam Houston Pkwy. You can turn right from Bissonnet into the parking lot, or, if you come to the Beltway, turn right onto the feeder road and then an immediate right into the parking lot. From the West Sam Houston Pkwy South, heading North: Take the West Bellfort exit and travel about two miles on the feeder road to Bissonnet. Turn right on Bissonnet and then left into the parking lot of the first building on the left, OR do not turn on Bissonnet but drive through the intersection and then make an immediate right into the parking lot. From S Loop 289, take the Quaker Ave exit and go South. Turn right on 82nd St.
MCALLEN, Texas 7000 N. 10TH STREET Suite C-4, From S Expressway 281/S US-281, turn right onto E Trenton Rd. Turn left onto N 10th St/TX-336. The test site is on the left. From I-20, take Midkiff Road exit. Go North on Midkiff Road. Take a left on Illinois Ave. Go .8 miles and turn right into Chinese Kitchen?s parking lot at 4200 W Illinois. Suite is at the end of the left Strip. San Antonio, Texas 9502 Computer Drive, Suite 105 From I-10 West, take exit 561 for Wurzbach and Medical Drive. Stay on the access road passed Medical Drive, then turn left on Wurzbach (going under the freeway). Proceed one block on Wurzbach, then turn left on Bluemel. Proceed one block on Bluemel, turn left on Computer Drive, then turn right into the parking lot for the Neuromuscular Institute of Texas at 9502 Computer Drive. PSI is in suite 105. From I-10 East, take the Wurzbach exit and turn right on Wurzbach (going under the freeway), then follow the directions above. San Antonio, Texas 6800 Park Ten Blvd. Ste 174W, From W I10 traveling east (to San Antonio) take exit 565B for Vance Jackson. Use the turnaround to go under the freeway). Proceed on the access road heading west to the One Park Ten Building (just past First Natl. Bank). After entering our parking lot driveway, turn left. Our office is in the West building. From W Loop 410 or W Loop 1604 exit to I10 heading East to San Antonio then follow the above directions. From W I10 traveling west take exit 565A for Crossroads Blvd/Balconies Hgts. Stay on the access road to the One Park Ten Building. After entering our parking lot driveway, turn left. Our office is in the West Building. Tyler, Texas 3800 Paluxy Dr., Suite 310 From I-20 turn south on Hwy 69 and go to Loop 323. Turn right (East) on 323 and follow Loop 323 to the intersection of Paluxy Drive. Turn right on Paluxy Drive. The building will be immediately on the left. Waco, Texas 345 Owen Lane, Suite 124 From TX-6, take the Waco Drive exit, loop under the bridge where you will be on Sanger Ave, turn right on Owen Ln. The examination site is behind the Richland Mall and directly across the street from the City of Waco water tower. If you are coming in on the South Hwy 6, take the South Loop 340, then take Sanger Ave Exit.